DAY 558 - Are You The Same As Solomon? A campaign starting on the first Sunday of March for three months. It is for one Discipler gathering two friends to meet once a week to have devotion with them and encourage them to have daily devotion all through the three months from March through May. Praise the Lord that we completed our 500 days/24 hours Prayer Campaign! We have a new link for you to sign for the new stage. You really need to join us now to pray! The easiest way is to take one hour slot for the whole week. We need you to join us! Trust in the power of prayers! What I heard from Jesus today is: Are you the same as Solomon? Almost everyone criticizes the attitude of Solomon when they know that Solomon used 13 years to build his palace and only 7 years to build God's temple. And Jesus said today, "Are you the same as Solomon? Why do you judge Solomon and in fact you are worse than he was? How much do you offer to me each week and how much you spend on yourself?" Wow! That is a big challenge! I think from now on Michelle and I need to have a book recording how much we spend on ourselves as in eating out, buying things, touring etc. and how much we offer to the Lord each week. Why do we judge Solomon and in fact we may offer $200 a week but spend $500 or more a week! Thank you Lord for this new paradigm shift and challenge today. Oh, the Lord keeps on revealing something deep down in my heart. I am kneeling in the hotel room(I arrived at Pasadena, California just two hours ago for my last Fuller D. Min. course under Professor Terry Walling. The course will be from tomorrow till Friday) singing "You are my all in all" and my heart beats fast and loud! Jesus revealed to me since 1980 I started my job in the Music Office of the Hong Kong Government and my first American Express, I became a big spender. The Lord reminded me of a song in the TV to promote lavish spending and the title of the song is "I am a big spend-er". The Lord challenge me not to buy anything for myself from tomorrow until Easter Sunday! Wow! I have never tried this before. Pray for me that I am not going to buy anything for myself, no clothes, pant, tie, CD, DVD, shoe etc.. I need your prayer to do this kind of Daniel fasting! I am speechless when you challenge me like that. Help me to love you more than myself. In Jesus name I pray. Amen. DAY 557 - Where to Get Your "Spec"? The temple was finished in all its details according to its specifications. He had spent seven years building it. What I heard from Jesus today is: Where to get your "Spec"? For engineers, if they do not have a "spec", they cannot do anything. Everything they do are according to the specifications. I deeply believe and in reality am experiencing daily that God would like to give a "spec" for us to follow so that we can be "on track". But, most of us do not know, or know but do not want to follow. That's why so many Christians are running here and there without direction, got depression, burn out and quit everything! Let's pray to our Lord Jesus Christ for the tailor-made "spec"! I wait for you daily to give me your instruction and 'spec' so that I can build according to your will. In Jesus name I pray. Amen. DAY 556 - Do You Know Your Father's Heart? What I heard from Jesus today is: Do you know your father's heart? Solomon knew his father David's heart and his Heavenly Father's promise that he should be the one to build a temple for God. How wonderful it is that a son could know his father well and do the thing which his first generation could not do. The Lord reminded me of our elder son Ignatius. 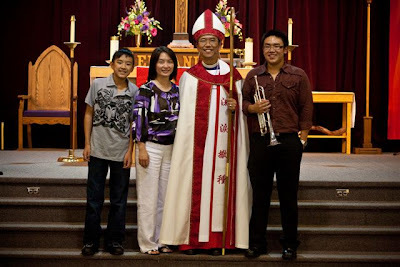 He prayed for three years to discern what the Lord wanted him to do after he graduated from University of British Columbia. 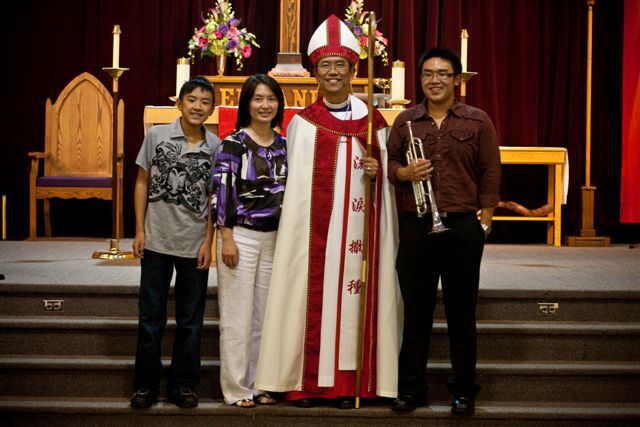 The Lord gave him three confirmations that He called him to Regent College for his M. Div. to prepare himself to be an Anglican Priest. One of his obstacles was that his father was a priest; he didn't want people to say that he followed his father. Then on the day of my consecration to be a bishop on September 9, 2009 in Pasadena, Pastor Rick Warren preached and told us that he was the fourth generation of pastors' family. His father was a pastor, his grandfather was a pastor and his great grandfather was a pastor. Then the Lord told Ignatius, "Do you understand it needs four generations of pastors to make a Rick Warren?" In this postmodern age, fathers and sons do not have much connection or relationship. Oh, it is so sad! Let's help our people to go back to the root to re-establish an intimate relationship of fathers and sons! Help me to love my sons and help my sons to love me. In Jesus name I pray. Amen. 1. A good and faithful team. 2. Never a one-man band but rather appoint able leaders to tailor-made duties. 3. How do people know that your leadership works? This will enable your people will live happily, peaceful on all sides and everyone feel secure. 4. You will be a channel of words of wisdom, and people will love to come close to you and learn from you. How can you have these qualities and fruits? Pray for wisdom like Solomon and not for long life or wealth for ourselves or ask for the death of our enemies but for the gift of discernment. Is that easy to pray like this? Yes and no. It depends on your daily intimate personal relationship with Jesus. Nothing more and nothing less! Help me to have the gift of wisdom that I can be a good leader. In Jesus name I pray. Amen. Then Solomon awoke - and he realized it had been a dream. He returned to Jerusalem, stood before the ark of the Lord's covenant and sacrificed burnt offerings and fellowship offerings. Then he gave a feast for all his court. What I heard from Jesus today is: Fruit of being connected. How joyful Solomon was after his first encounter with God. It was not like Moses' face to face encounter or his father David's close and intimate dialogue. This encounter was through a dream. Yet he knew that the dream was from God. That's why he offered burnt offerings and fellowship offerings and also gave a feast for all his court. Then the verdict he gave to the two women and the description of how his people were in awe because of his wisdom demonstrated that his encounter with God was real. Just a dream? Well, that should be a good start. What was the story of your first connection to God: through dream, direct communication or never? What was the fruit after your first encounter with God? How intimate is your relationship with the Lord now? Thank you for giving me wonderful opportunities to come close to you, listen to you, talk to you and learn the importance of 'listen and obey'. Help me to stay close to you each day. In Jesus name I pray. Amen. DAY 553 - Courage to Act! DAY 551 - What's So Bad About David's Census? DAY 550 - Where's Your Mighty Men and Women? DAY 549 - How Well Do You Know Me? DAY 544 - Power of Love Over Love of Power! DAY 543 - They're Just Challenges! DAY 539 - Did David Miss Something? DAY 537 - Do You Have Your Band of Brothers? DAY 536 - How Kind Are You lately?